Who Owns Employee Work? The Employee or the Business? Who Owns Employee Work? What is Work for Hire? Is the work of employees owned by your company? Or by the employees? What about the work of independent contractors? Who owns it? Before you hire a creative employee or contractor, you'd better be sure you know the answer to these questions, and be ready to put your understanding in writing, to be signed by both parties. 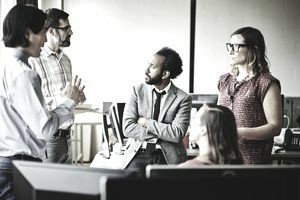 Taking an intellectual property (IP) dispute to court can be difficult unless you have created a work-for-hire agreement with your creative staff. The concept of ownership of work is tied to the concept called "work for hire." Work-for-hire is the idea that work done in a relationship where one entity (usually a business) hires someone to create something, then the work belongs to the hiring entity, not the person who did the creating. Generally, any work done by an employee is the property of the employer. For example, if an engineering firm hires an engineer to create patentable software or hardware, the work-for-hire concept is in force, and the creations of the engineer are the property of the company. The same would typically be true of an engineer hired as an independent contractor - the work is the product of the entity who hired it to be done. Thus, the work-for-hire concept is an exception to copyright law, in which the work is owned by the creator. "if the parties expressly agree in a written instrument signed by them that the work shall be considered a work made for hire." A work created by an independent contractor can be a work made for hire only if (a) it falls within one of the nine categories of works listed ...above and (b) there is a written agreement between parties specifying that the work is a work made for hire. The discussion above only includes copyrighted works. Other types of works such as patents are even trickier. Who owns an invention - the employee or the employer? There's a difference between being designated as an "inventor" on a patent application and owning the patent. Contracts between a business and creative employees should spell out these details carefully. A business doesn't necessarily own everything created by its workers. The question of ownership comes down to many factors, chief among them being the presence of an employment contract. Employees typically produce work that is owned by the business - if they write a memo at work, the business owns the copyright in that memo. However, an employment contract might modify how the employee's work is treated, possibly by broadening or narrowing the definition of what the business owns. And it also depends on what sort of work is created, at what time, and with what resources. Independent contractors, on the other hand, might own the work they produce themselves. This depends on a number of factors, such as whether there is an agreement between the business and the contractor, the nature of the work at issue, when the relationship began, and when an agreement was signed. Sometimes, it isn't even clear whether the worker is an employee or an independent contractor. Whether the business owns the property created by the worker then depends on the business's control over the worker, the skills necessary for the job, the extent of benefits given to the worker, tax treatment of the worker, and a number of other factors. Each situation is different and the rules or factors can't be generalized and applied all the time. The work-for-hire question is another reason for putting every agreement into writing. Unwritten assumptions can come back to bite you. Employees, in particular, don't always understand the concept that their work is your property, so having them sign a contract helps make it clear who owns what. As you can see, these types of situations are difficult and each is unique. The difference between an employee and an independent contractor, for example, can be slippery, and it must be determined on a case-by-case basis. Get an IP attorney (or a patent agent) who works specifically in the area you need help with to make sure the understanding is as clear as it can be. Disclaimer: This information and the quote by Tom Galvani, are not intended to be used as legal advice. If you need assistance with a specific situation, contact your own attorney. Are You Paying Employees for All Work Time? Check to Make Sure.